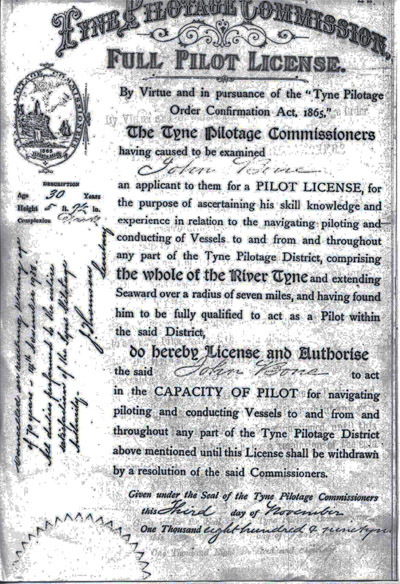 Just how far the Institution of Pilotage upon the River Tyne goes back, it is not possible to trace, but from early records we find it was originally confined exclusively to members of the Trinity House of Newcastle upon Tyne , which City for long held a stranglehold monopoly upon everything connected with the river. Pilotage was incorporated in a Charter granted by Henry VIII, on 5 th October 1536, but it is probable that Trinity House had control of pilotage prior to that date, as the oldest existing order book of the ‘House’ commencing in 1539, while making several references to pilotage dues termed ‘Loadmannage’ in those distant days, refers to still earlier entries in the ‘Owyld Lodmannage Bouk’ now lost. The powers of Trinity House were extended by Charters of Edward VI, 1548 and Mary I, 1553; in 1584 the Corporation of Newcastle disputed the exclusive claim of the Trinity Brethren to pilot all ships of strangers on the Tyne , but the Charter of Elizabeth I confirmed in the same year, the contention of Trinity House that pilotage was compulsory. A Charter of James I on 18 th January 1606, extended their jurisdiction to cover the coast from Blyth to steays (now Staithes ) in Yorkshire, it left the engagement of pilots as optional, and fixed the ‘Loadmannage’ at twelve pence per foot draught on laden, and eight pence per foot on light vessels. 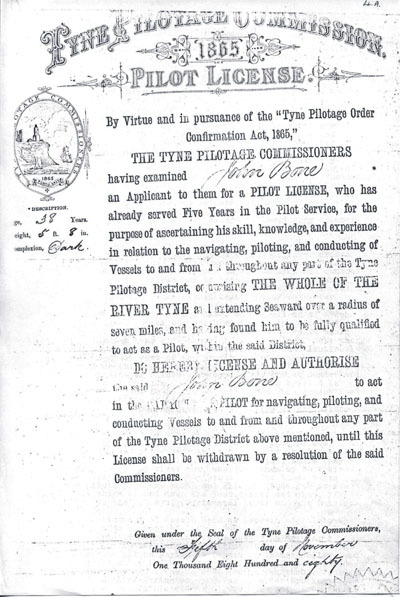 In 1672, the restriction of pilotage to Brethren of Trinity House was amended by Charter a of James II, which also directed the Corporation of Newcastle to elect as Free Burgess, one James Ayre (a name still borne by a family of South Shields pilots) pilot of his ship St. Michael. By the Great Charter of James II, on the 1 st July 1687, the jurisdiction of Newcastle Trinity House was extended embracing the coast from Holy Island to Whitby, but the office of ‘Pylott’ was not specifically confined to members of Trinity House. The Licences granted in those early days absolved the holders from Impressment in the Navy, bearing arms or serving on Juries. In 1760 it is recorded the Press Gang did impress a number of pilots, but when the vessel put to sea the pilots took possession and sailed into Scarborough, there released themselves and returned home. From Commonwealth times Trinity House had maintained a service of resident pilots at Shields, but with the throwing open of the port to non-members of Trinity House, the pilotage service became more generally recruited from the sea-going community of South Shields, the exigencies of the service led to pilots taking up residence on or near ‘The Lawe’ a high district overlooking the harbour entrance and coastline, at which place they flourished as a community within a community, and more or less apart from the rest of the town. Similarly the practice of taking only sons or relatives of pilots to serve in their ‘cobles’ made the service an almost exclusive body, strictly confined to members of certain families. This system was dictated by Trinity House who by resolution ordered that applicants for Licences be refused unless they are relatives of the present pilots or Brethren, as it is right to confine it to those who have always followed that occupation. At this period approved applicants were not subject to examination, as to proficiency, for Licences or ‘Branches’ (i.e. Branches of the Charter) as they were known, the appointments being made upon the recommendations by certificates of Shipowners or Shipmasters who testified as to the character and ability of the applicant to discharge pilotage duties. The duty of the Shields or Barr Pilots as they were known, was to conduct ships in and out of the harbour, over the bar, but were not permitted to above Whitehill Point, a distance of about two miles. That duty was delegated to the Town or River Pilots, who were sub-divided into up and down Rivermen. Trinity House also issued to members ‘Sea Branches’ which correspond to the present North Sea Pilots. The Barr Pilots were under the supervision of an official known as the Captain of Pilots, who was one of the Elder Brethren of Trinity House, the earliest appointment being that of Joseph Reed in 1724, he was succeeded in 1738 by Loftus Danby, who held office for many years, as in 1754 Mathias Giles was appointed to look after the pilots that they keep regular turns, the pilots paying no regard to Thomas Medley who is the orderer under Loftus Danby, who is nearly blind. Danby was succeeded by Captain Wm. Errington, who during the 1745 rebellion, helped defend Carlisle . He died in 1773 while Captain of Pilots. A strict discipline was exercised over the pilots and neglect or inefficiency was punishable by fine or revocation of Licences which cost ten shillings and sixpence per annum. One punishment is recorded in the order book as ‘Broke never to take charge of any ship as pilot again’ The regulated system of turns did not dabar the right of selection by shipmasters, and as early as 1748 a rule was passed permitting choice pilots to claim pilotage out of their turns, this was the beginning of an evil which had repercussions over a long period. Apparently there were on useful Harbour Marks or Buoys at this time, and those that were erected between 1772 and 1789 were either misleading or too low to be of use. In 1799 the Shipowners of Shields implored Trinity House to immediately erect two leading Beacons on the South side of the harbour, with buoys in the channel and proper directions for taking the same. The Shipowners of Scarborough added their weight, and Trinity House built two Beacons shortly afterwards. By the Newcastle Port Act of 1801 Trinity House was empowered to examine all applicants for Licences, and to inflict punishments, fines etc., for misdemeanours. Pilotage was compulsory on all foreign ships, but optional on British ships, and the rate to be one shilling and threepence per foot in summer and one shilling and sixpence in winter, for pilotage in the sea section. These rates continued in force until 1936, when summer pilotage was abolished. For River Pilotage too, or from above Bill Point one shilling and sixpence per foot was fixed, and below Bill Point one shilling per foot, while foreign vessels paid sixpence more per foot in each case. In 1803 Joseph Hogg was appointed Captain of Pilots, and John Thompson succeeded him in 1815. Wm. Pearson was appointed in 1845, and James Kelly in 1864, the last Ruler appointed by Trinity House. About the year 1803, Trinity House established and managed two funds respectively called the River Pilots Fund and Sea Pilots Fund, these funds were created by payment by the pilots of one shilling per ship (i.e. sixpence each way on all ships, employing them entering or leaving the Tyne) it was known as ‘Turn Money.’ By certain returns made to parliament, it would appear these funds were applied to the payment of fixed allowances to retired pilots, widows and children of deceased pilots, and salaries of the Sea and River Pilot Captains. The Sea Pilots had no representation in their management however, and not being Freemen of Newcastle could not become members of Trinity House, and this caused much dissatisfaction among them. In 1824, Mr. Huskissons reciprocity act enabled the Government to enter into Treaties with other Nations for affording mutual facilities with respect to pilotage, and other matters, the effect of this act and of subsequent Treaties with foreign Nations was that vessels of such Nations were no longer compelled to employ pilots, and if they did voluntarily employ them, they paid the same rates as British vessels. To compensate for the loss pilots would suffer in consequence, the Government provided for the payment to Trinity House of an annual sum, equivalent to any differences. The sum paid to Trinity House however differed considerably from the amount paid as reciprocity money to the pilots. This difference Trinity House called ‘Unclaimed Pilotage’ and placed it to the funds of the River and Sea Pilots. They repeatedly refused to disclose accounts of the amounts so accumulated, or distribute them among the pilots. In 1846 the pilots requested Trinity House to purchase from the funds in their possession, a steamboat for the purpose of taking them to sea in heavy weather, this was refused, and the pilots themselves eventually provided a steamer which was launched from Woodhouse Yard at South Shields on 23 rd January 1852, and named ‘Pilot’ while a second vessel the ‘Robert Ingham’ was obtained in May 1855. In 1885 the system of apprenticeship was amended, and pilots assistants were to serve a three year probationary period, one in cobles, one in sail and one in steam. Between 1852 and 1855 the pilots had out of their own pockets, provided at different times, the cost of four steam vessels to act as Pilot Vessels in bad weather. During the time they were not thus employed, they acted as tugboats, though it would appear that income from this source was credited to management expenses. Eventually the Board agreed to provide a steam vessel when necessary and pay for it out of the boarding fund instituted in 1885. After paying each year for the hire of a vessel which in one year alone amounted to fifteen hundred and fifty pounds, this fund by 1906 stood at eleven thousand pounds, when it was decided that the time had arrived for a steam cutter to be obtained for the whole time use of the pilots. In 1907 the pilot cutter ‘Protector’ was built to the order of the Commission, by J.P. Rennoldson, South Shields , and the system of seeking in cobles abolished. Assistants now had to serve five years in this vessel, one in sail and one in steam, the ‘Protector’ was 110 feet long with accommodation for 19 pilots, and gave very satisfactory service during her short life; about the same time the twin screw vessel ‘Miner’ was purchased from the War Dept., to act as an outward tender and relief vessel. Owing to the growth in the size of ships using the port it was decided that the step from Acting Order 500 tons to Branch Licences was too great. In November 1904 Second Class Licences were introduced limiting pilotage to ships of 800 tons, and these three classes continue to the present day. A candidate must now apart from the present probationary period of six years as assistant, serve at least two years each as Acting Order and Second Class before applying for a First Class Licence. The outbreak of War in 1914 made the Tyne along with others a compulsory pilotage district, and saw the passing of constant pilotage, except for new vessels built on the river. On the 31 st December 1916 during the early hours the ‘Protector’ whilst on station was sunk, presumed by enemy action with the loss of all hands. In 1917 the Commission purchased the ‘Queen of the May’ a steam yacht originally owned by the Coates family of cotton thread fame; this vessel has proved particularly suitable as a pilot vessel and though expensive to run, has given yeoman service throughout her 22 years of piloting. In 1920 the ‘Miner’ was no longer considered suitable and was sold, at the same time a motor launch was obtained for the outward service, this vessel the ‘Tertia’ was lost shortly afterwards. To relieve the ‘Queen of the May’ the Commission purchased the steam drifter ‘Britannia’ which after conversion was found to be a wet and uncomfortable sea boat. To replace the ‘Tertia’ the ‘Sheldrake’ was next obtained, this vessel was also unsatisfactory, not being sufficiently strong for the rigours of the service, and in 1925 J.G. Mitchison of South Shields was commissioned to build two motor launches, the ‘Tyne’ and ‘Team’ to work the outward service. In 1925 the ‘Queen of the May’ was involved in a serious collision, following this accident the vessel was re-boilered. A fire in the ‘Tyne’ led to her being re-built in 1936 and fitted with a diesel engine. In 1938 the ‘Britannia’ was sold for scrap and a new diesel motor launch to be named ‘Vigilant’ ordered from Walter Reekie of St. Monance. In 1905 A.L. Ayre followed John Purvis as Pilot Master, and retired in 1908 when Capt. Chas. K Sergeant was appointed, he was followed by Capt. L.M. Lamb in 1915, and on his death in 1932, Wm. Marshall succeeded after 25 years as deputy.